ww2dbaseAir Chief Marshal Sir Hugh Dowding (1882-1970), nicknamed "Stuffy" due to his reserved and undeniably crusty manner, led the RAF Fighter Command to victory during the Battle of Britain. ww2dbaseBorn on the 24th of April 1882 at Moffat, Scotland, Hugh Dowding was the son of a schoolmaster. Educated at Winchester and then at the Royal Military Academy in Woolwich, Dowding was commissioned as a subaltern in the Royal Garrison Artillery, seeing service in Gibraltar, Ceylon and Hong Kong before being transferred to India where he served for some time with a Mountain Artillery battery. ww2dbaseReturning to Britain, Dowding became fascinated with flying machines. Approaching the Aero Club at Brooklands, he pleaded with them to give him flying lessons on credit. The Aero Club agreed and with a mechanic as his instructor gained his flying certificate with just two hours instruction. With this certificate he was successful in gaining acceptance into the Royal Flying Corps as a pilot in December 1913.
ww2dbaseIn 1915 Dowding was given command of No.16 Squadron in France, but following the Battle of the Somme in 1916, he clashed with General Trenchard, the RFC commander, over the need to rest pilots exhausted by continuous duty. Sent back to Britain, he would play no further part in the Great War despite being promoted. ww2dbaseIn 1918, Dowding joined the newly created Royal Air Force, serving in various positions at home and in the Middle East. Promoted Air Vice Marshal in 1929, he was appointed to the Air Council in the following year with responsibility for matters regarding supply and research. In this role he encouraged the development of advanced fighters, such as the Spitfire and Hurricane, and encouraged the research into radar-all of which would play a vital part in the Battle. Promoted Air Marshal in 1933 and knighted by the King in the following year, Sir Hugh, with his usual uncompromising, single-minded devotion to British air supremacy coupled with his immense skill and experience would actively organize the restructuring of the nations air defence - setting up a network of communications that would link the radar stations, Observer Corps, Balloon Command and the various defence organisations with all the headquarters commands. 10 Group (Air Vice-Marshal Sir Quintin Brand) with responsibility for the air defence of Wales and the West Country. 11 Group (Air Vice-Marshal Keith Park) to cover the southeast of England and the critical approaches to London. 12 Group (Air Vice-Marshal Trafford Leigh-Mallory) to defend the Midlands and East Anglia. 13 Group (Air Vice-Marshal Richard Saul) to cover the north of England, Scotland and Northern Ireland. ww2dbaseAs head of Fighter Command, Dowding was soon at odds with the Air Ministry, arguing that priority should be given to development of aircraft for the defence of Britain, rather than producing a fleet of bombers. Well aware that, in the event of war, the RAF would struggle when pitted against the Luftwaffe, Dowding advised Prime Minister Neville Chamberlain to appease Hitler in order to gain time to prepare the country for war. ww2dbaseIn 1940, Dowding worked closely with Vice Marshal Keith Park, AOC No.11 Group, in providing cover for the evacuation from Dunkirk. Although Dowding had only 200 aircraft at his disposal, he managed to gain air superiority (although this was not always obvious to those awaiting evacuation)which greatly helped to ensure the safe return of the BEF. Dowding was however less than willing to sacrifice his pilots in the Battle of France - which he already considered to be a lost cause. ww2dbaseDuring the Battle of Britain Dowding was criticised by Vice Marshal William Sholto Douglas, Assistant Chief of Air Staff, and Vice Marshal Trafford Leigh-Mallory, for not being aggressive enough. Douglas took the view that the RAF fighters should be sent out to intercept the German aircraft before they reached Britain. Dowding rejected this strategy as being too dangerous and argued that such action would increase the number of valuable pilots being killed. With hindsight we can see that this was indeed the correct strategy - targeting the German bombers after their fighter escorts ran low on fuel. 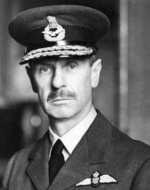 Air Chief Marshal Charles Portal, the new Chief of Air Staff, however agreed with Douglas in the dispute over tactics and in November 1940 (soon after Hitler finally called off Operation Sealion), he removed Dowding. Douglas having the added satisfaction of replacing him as head of Fighter Command. ww2dbaseThis was effectively the end of Dowding's career. Despite being recognised for winning the battle (even his old adversary, Lord Trenchard, having to admit that he had seriously under-estimated him for 26 years) and being awarded the Knight Grand Cross, his forthright manner had made him too many enemies in high places. Sent by the Air Ministry to the US to lecture, he finally retired from the RAF in 1942. For his outstanding foresight, deep sense of purpose and leadership that prepared Fighter Command to face and defeat the Luftwaffe and thus saving the country from the threat of Nazi invasion, Dowding was created First Baron Dowding of Bentley Priory (the location of Fighter Command's Headquarters) in 1943.
ww2dbaseLord Dowding died at his home in Tunbridge Wells, Kent, on 15 February 1970. 24 Apr 1882 Hugh Dowding was born. 14 Jul 1936 Hugh Dowding was appointed the first commander-in-chief of the British RAF Fighter Command. In this role, he was also in charge of the Anti-Aircraft Command, the Balloon Command, and the Observer Corps. 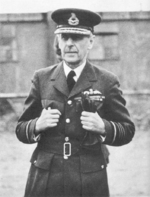 15 May 1940 In London, England, United Kingdom, at a British cabinet meeting attended by Winston Churchill, Archibald Sinclair, Lord Beaverbrook, and Cyril Newall, Air Chief Marshal Hugh Dowding argued the case for expanding the strength of RAF Fighter Command to 52 squadrons for the immediate air defence of Britain. Despite his insistence that no more squadrons should be sent to France orders were still given to send four more squadrons to France. 30 Sep 1940 Hugh Dowding was made Knight Grand Commander of the Order of Bath. 17 Nov 1940 British Air Chief Marshal Hugh Dowding was removed as the head of RAF Fighter Command after losing a political struggle with Sholto Douglas and other Big Wing proponents. 1 Oct 1941 The British RAF reported internally on Hugh Dowding's (forced) retirement. When Prime Minister Winston Churchill learned of it, he was extremely displeased, and demanded the RAF to find a new position for Dowding. Dowding had originally conceded to political pressure and was preparing his retirement, but ultimately yielded to Churchill's wish and accepted whatever new position the RAF would give him. 15 Feb 1970 Hugh Dowding passed away. Elizabeth Quayle, a plotter at Bentley Priory during the war, recalled the following in the 1990s: "We all admired our 'Stuffy' (Dowding) enormously. We had great loyalty to him - I think you might call it affection... I don't know what there was about him but it inspired loyalty. He was very remote but if you met him, he was always a gentleman. We thought of him as an extremely able and dedicated officer. And quite frankly we felt that he saved Britain." Never in the field of human conflict was so much owed by so many to one man. Rest in peace,Stuffy! Strange the way the giants must be cut down as soon as they have done the impossible. this man should be a national hero in the same league as nelson or wellington,instead he is half forgotten by the nation he was instrumental in saving from tyranny.